You can increase your body’s absorption of iron-rich foods by eating them alongside foods that provide plenty of vitamin C. You’ll also want to avoid drinking coffee or tea, or consuming calcium-rich foods or drinks with meals containing iron-rich foods, as all three can hinder iron absorption. If you’re still having trouble getting enough iron through diet alone, consider adding a multivitamin with iron. Geritol® multivitamin contains 90% RDA of iron in every daily dose. Understanding Anemia – the Basics. 2005-2013. WebMD. Retrieved from: http://www.webmd.com/a-to-z-guides/understanding-anemia-basics. January 7, 2013. Iron-Rich Foods. 2005-2013. WebMD. 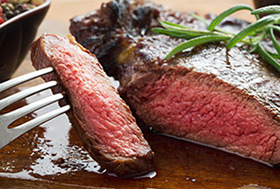 Retrieved from: http://www.webmd.com/diet/iron-rich-foods?page=2. January 8, 2013.